Goffredo Parise was born in Vicenza on 8th December 1929, from a nameless father and Ida Wanda Bertoli, step daughter of a merchant of bicycles, business that failed in the same year. He lived with his grandfather and mother a childhood marked by economic uneasiness and a kind of forced isolation: trying to get him sheltered from the tricks of his mates as he was a "natural" or illegitimate son, his family kept him at home as long as possible and they told him that his father was dead, while as a matter of fact he was a doctor from Veneto that had left Wanda alone when she was pregnant. The economic conditions of the family changed in 1937 when his mother married Osvaldo Parise, the director of a local newspaper , that some years later granted his surname to Goffredo. The boy went to the grammar high school (liceo) that ended in 1947. The family moved to Venice and there in 1951 the publisher Neri Pozza published his first novel Il ragazzo morto e le comete , (The dead boy and the comet stars) that was followed by La grande vacanza (The great holiday, not translated) in 1953. After some collaborations with the local newspapers Bolzano's "Alto Adige" and Verona's "Arena", the writer moved to Milan where started to work in the publishing house Garzanti, where in 1954 he published Il prete bello (Don Gastone and the ladies or The priest among the pigeons), not welcomed by critics, but doomed to be one of the best sellers among novels of the post-war period. In 1955 Parise started working for the newspaper "Corriere della Sera" and the following year Garzanti published Il fidanzamento (The engagement, not translated). In 1959 was edited Amore e fervore (the original title "Atti impuri" was changed by the editor). 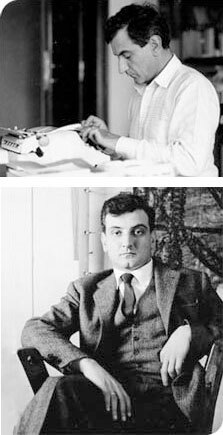 Meanwhile in 1957 Parise got married to Maria Costanza Speroni, his wedding witness was the writer Giovanni Comisso. During the 1960's he became a screen playwright and he collaborated to the screenplay of two movies directed by Mauro Bolognini: Agostino (1962, taken from a novel written by Alberto Moravia) and Senilità (1962, taken from a novel by Italo Svevo). Among his movie experiences, we should remember L'ape regina directed by Marco Ferreri (1963), that Parise took from his play La moglie a cavallo and the co-operation with Federico Fellini for an episode of Boccaccio '70 (1962, it is about the temptations of doctor Antonio acted by Peppino De Filippo) and for the masterpiece Otto e mezzo (1963). In 1963 his bond with Maria Costanza Speroni came to an end and they got divorced. From this experience of emotional crisis came L'assoluto naturale (The absolute natural, not translated), written for the theatre and focussed on the analysis of the couple. The play was acted in the Teatro Metastasio in Prato in 1968, directed by Franco Enriquez and acted by Valeria Moricone and Renzo Montagnani. In 1965 the novel Il padrone (The boss) was published. It let him get the Viareggio prize and, by means of describing the working activities inside a factory, it expresses the existential uneasiness of a society that is trying to cancel the individual identity. In 1966 Parise published Gli americani a Vicenza (The American People in Vicenza, not translated), a tale written ten years before; in the same period he met Giosetta Fioroni, a painter that became his partner. In 1969 some tales written between 1962 and 1966 were gathered inside a booked entitled Il crematorio di Vienna (The Crematory in Vienna, not translated). Meanwhile his journalistic activity was really intense and he got inspiration from travelling around the world. He wrote Cara Cina (1966), Due, tre cose sul Vietnam (1967), Biafra (1968). In the following years he published Guerre Politiche (Political wars, 1976, about Vietnam, Biafra, Laos and Chile), New York (1977), L'eleganza è frigida (1982, about Japan). After publishing the tales of Sillabario n.1 (Solitudes n.1, 1972), Parise got back to the movies cooperating in the screenplay of "Ritratto di borghesia in nero" (Picture of the middle class in black) directed by Tonino Cervi (1978), taken from a tale by Roger Peyrefitte. As it was happened with "L'ape regina", even this movie has problems with censorship. In 1982 Sillabario n.2 (Solitudes n.2) was published, getting to an end the deep analysis of human feelings led by Parise by means of a partaking attention. Inside the two volumes, considered by some critics as his masterpiece, the author dedicated a short tale to each kind of feeling, from which you can detect a kind of new discovery of real human values. Parise lived his last years in the region of Veneto, in the little town of Ponte di Piave. Deeply sick, he died in Treviso on 31st August 1986.